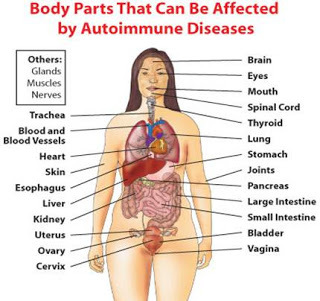 – An autoimmune disorder may affect one or more organ or tissue types. 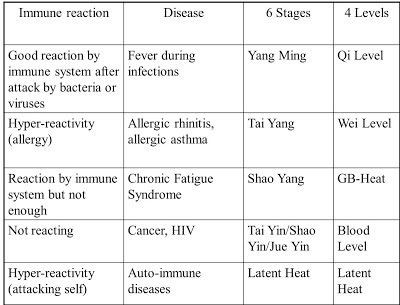 It is a very common misconception to attribute the immune response to Wei Qi which is natural since it is indeed the “protective” or “defensive” Qi that protects from exterior pathogenic factors. The following is the Chinese ideogram for “Wei”. The inside part is phonetic (wei) while the two outer parts together are xing, i.e. to move. Separately, they are the left and the right footprint and some say they suggest two guards patrolling back to back, hence Wei Qi being defensive Qi. 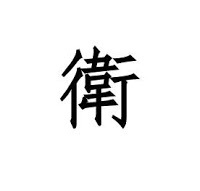 These two parts together form the character xing行which means “to move” (and it also the character for “Element” as in the “5 Elements”. The modern, simplified character for “wei”卫does not mean anything. Upper Burner, which it is. However, it is said that the Wei Qi comes from the Lower Burner because it is associated with Kidney-Yang. Of course, it is also true that the Wei Qi is diffused in the Upper Burner by the Lungs, but its origin is in the Lower Burner. 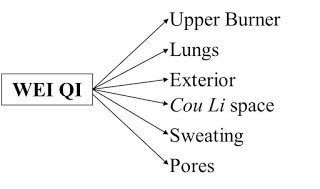 Wei Qi goes to the Upper Burner and the Lungs “diffuses” itlike an aerosol sprayto the Upper Burner, the skin and the Cou Li space. Although we stress a lot the descending of Lung-Qi, the diffusing of Lung-Qi [xuan 宣] has an ascending movement. Ying Qi also keeps the Cou Li space “consolidated”; if the Cou Li space is not “consolidated” it is prone to invasions of Wind. If the Ying Qi is weak in this space, there is slight sweating during an invasion of Wind. 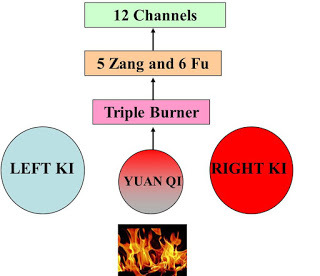 The “three Qi” mentioned here are the Yuan Qi, Ying Qi and Wei Qi of Lower, Middle and Upper Burner respectively.Yuan Qi is part of a triad of types of Qi, all which play a role in resistance to disease in the three Burners: Yuan Qi in the Lower, Ying Qi in the Middle and Wei Qi in the Upper Burner. 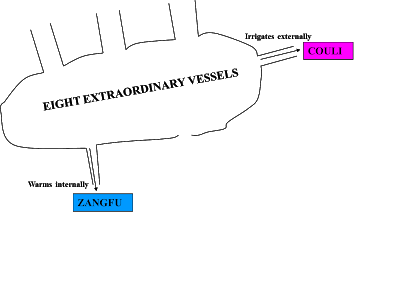 – Du Mai: SI-3 Houxi with BL-62 Shenmai, BL-23 Shenshu, Du-4 Mingmen, Du-14 Dazhui. – Ren Mai: LU-7 Lieque with KI-6 Zhaohai, Ren-4 Guanyuan. 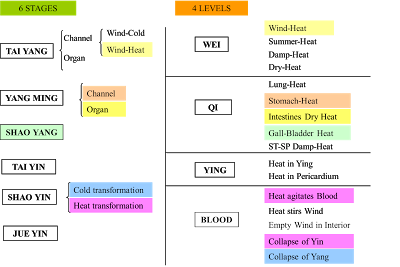 The 6 Stages were developed by Zhang Zhong Jing in his book “A Discussion of Diseases from Cold Injury” (Shang Han Lun, ca. AD 220)while the 4 Levels were developed much later by Ye Tian Shi in his book “A Discussion of Warm Diseases” (Wen Bing Lun, 1742). In autoimmune diseases, the immune system has a deep dysfunction that leads it to attack the cells of the body, mistaking them for “other”: this often (but not always) corresponds to Latent Heat. The only thing they might have in common is the aetiology. In many, but not all, auto-immune diseases the aetiology is Latent Heat. This is the case especially when there are symptoms of Heat, with lassitude and possibly fever, they have something in common in their pathology. In other cases of autoimmune diseases, the main pathology may also be Yin Fire.Also, if we know we are dealing with an auto-immune disease, it gives us an important pointer from the point of view of prognosis. 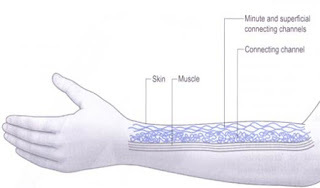 However, there is an interesting common feature of some auto-immune diseases and that is the pulse. I have noticed this especially in MS, RA, Hashimoto’s thyroiditis and Crohn’s disease. The pulse is of the Leather [ge 革] quality, i.e. it is superficial and “stretched” like a drum but empty at the deep level: it feels hard on the outside but empty inside, like a drum. The Leather pulse indicates severe deficiency of Blood, Essence or Yin. It also indicates Qi floating upwards because it is not rooted by Blood. This would indicate that the root of these autoimmune diseases is a Kidney deficiency. – No Chinese theory obviously. – All diseases are very different and must be treated according to their specific pathology and patterns (e.g. 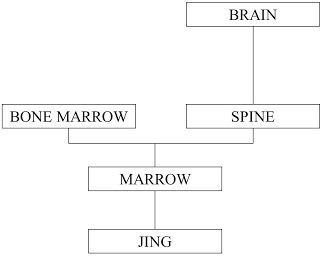 MS and Hashimoto’s thyroiditis have nothing in common from Chinese perspective). – Being auto-immune affects ease (or difficulty) of treatment and prognosis. They are more difficult to treat. – Compare hyperthyroidism and Graves’ Disease: latter has more severe symptoms andwill be more difficult to treat. – In late stages of auto-immune diseases, there seems to be a common pulse, i.e. the Leather pulse which is superficial but empty at the deep level. The surface is kind of “broad” and feels kind of stretched likea drum. This indicates a severe Kidney deficiency. – Must grasp aetiology, pathology and patterns of the disease ignoring its auto-immune nature. For _example, Sjogren’s Syndrome, Hashimoto thyroiditis, Crohn’s Disease, MS and RA have very little or _nothing in common in terms of pathology. – Must treat the Kidneys which are the root of the auto-immune process. This can be Kidney-Yang, Kidney-Yin, Jing, Yuan Qi, Minister Fire. – Must treat inflammation with at least one or two anti-inflammatory herbs. – Check if there is Latent Heat or Yin Fire and treat them accordingly. As one can see, this list is so extensive that practically every formula we use will have some anti-inflammatory herb in it. I believe it is very important to use some anti-inflammatory herbs in the treatment of autoimmune diseases. I especially use Mu Dan Pi Cortex Moutan.It is worth also noting that the anti-inflammatory herbs are found in many different categories of herbs, not just those that clear Heat: thus having an anti-inflammatory effect does not necessarily involve clearing Heat from the Chinese perspective. Indeed, it is very interesting (and somewhat surprising) that even Fu Zi and Cao Wu (extremely hot herbs) are anti-inflammatory. The following is an online article from Harvard University about the effect of the Chinese herb Chang Shan Radix Dichroae febrifugaeon autoimmune diseases.